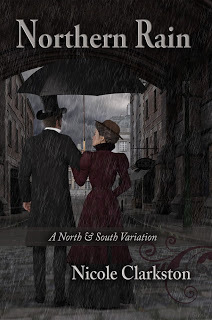 Last month Nicole Clarkston published a new North and South variation called Northern Rain which I could not resist to buy and read as soon as I heard about it. I had been a fan of Nicole Clarkston’s work for a while but had never spoken with her so this new release was the trigger for me to finally contact her. I’m very glad I did because after getting to know her, I discovered she is one of the nicest, sweetest, funny and creative authors I have known. I fell incredibly blessed to have had the chance to know her, and to have her as a guest in my blog for the first time with a vignette she wrote especially for From Pemberley to Milton. Her visit was prior to the blog tour that started on the 8th of July and in which I will also participate with a character interview on the 18th, and she brought with her a very generous offer of 4 e-book copies of Northern Rain and one signed paperback. May I ask the lucky winners to please send me your e-mail contacts to ritaluzdeodato at gmail so that I can pass them along to Mrs. Clarkston for the Books to be sent to you. Woohoo, guys! Enjoy those books. And Rita, that is neat that you got to know Nicole better and start up a bookish friendship over N&S. 🙂 Looking forward to your thoughts on this one. I’ve been enjoying all her vignettes and want to read the story for myself. Congratulations everyone, and happy reading! Thank you for having me, Rita. It has been a delight getting to know you! Congrats to Ana,Joana,Kirsten and Vesper!!! Enjoy!!! Milton, here I come. Thanks ever so much, Nicole and Rita!